Dhaka, 25 Feb, Abnews: At least 70,000 years ago Homo sapiens used perforated marine shells and colour pigments. From around 40,000 years ago he created decorative items, jewellery and cave art in Europe. Using Uranium-Thorium dating an international team of researchers co-directed by Dirk Hoffmann of the Max Planck Institute for Evolutionary Anthropology in Leipzig, Germany, now demonstrates that more than 115,000 years ago Neanderthals produced symbolic objects, and that they created cave art more than 20,000 years before modern humans first arrived in Europe. The researchers conclude that our cousins’ cognitive abilities were equivalent to our own. Early symbolic artefacts, like pigment-coloured shells that possibly served as body ornamentation, are documented for the Middle Stone Age in North and South Africa at around 70,000 years ago and are associated with anatomically and behaviourally modern humans. There is evidence in Europe for cave art, sculpted figures, decorated bone tools and jewellery made of bone, tooth, ivory, shell or stone that dates back to the so-called “Upper Palaeolithic Revolution” around 40,000 years ago. These artefacts, researchers concluded, must have been created by modern humans who were spreading all over Europe after their arrival from Africa. U-Th dating, a very precise dating technique based on the radioactive decay of Uranium isotopes into Thorium, determines the age of calcium carbonate formations up to an age of 500,000 years. It thus goes back considerably further in time than the radiocarbon method. The researchers from Germany, UK, France and Spain analysed more than 60 carbonate samples that consisted of less than ten milligrams each from three different cave sites in Spain: La Pasiega in north-eastern Spain, Maltravieso in western Spain and Ardales in southern Spain. All three sites contain paintings mostly in red, sometimes in black, that show groups of animals, dots and geometric signs, hand stencils, hand prints and engravings. “Our dating results show that the cave art at these three sites in Spain is much older than previously thought”, says team member Alistair Pike from the University of Southampton. “With an age in excess of 64,000 years it predates the earliest traces of modern humans in Europe by more than 20,000 years. The cave art must thus have been created by Neanderthals.” This early cave art was created in red pigments and comprises lines, dots, discs and hand stencils. According to the researchers, their creation involved planning a light source, mixing pigments for colouring and choosing a proper location. 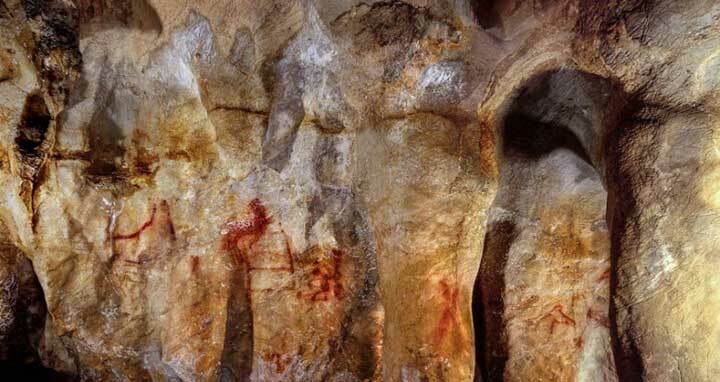 In the Iberian Peninsula Neanderthal symbolic behaviour may actually have a long-term tradition. In a second study, also published this week by Hoffmann and colleagues, the researchers determined the age of an archaeological deposit located at the Cueva de los Aviones, a sea cave in Southeast Spain. This cave contained perforated sea shells, red and yellow colorants and shell containers including complex mixes of pigments. The researchers used U-Th dating to determine the age of the flowstone that was covering and protecting the deposit. “We dated the deposit underlying the flowstone to an age of about 115,000 years,” says Hoffmann. These dates are even older than similar finds in south and north Africa associated with Homo sapiens, but at this time Neanderthals were living in western Europe.